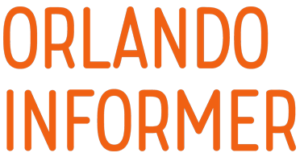 Last October, we brought you a listing of all the new experiences that were being lined up at Orlando for the end of that year and on into this one. A lot has changed in the last five months, however – we have more details on some 2018 openings, and we’ve also gotten a much better idea of what 2019’s additions are shaping up like (Star Wars! Harry Potter! Stunt shows and space-themed restaurants!). There’s so much good stuff coming, we couldn’t help ourselves – we just had to update our list. This, then, is everything that’s coming to Orlando from March 2018 all the way through to the end of next year. It’s a wild ride, so be sure to buckle up. 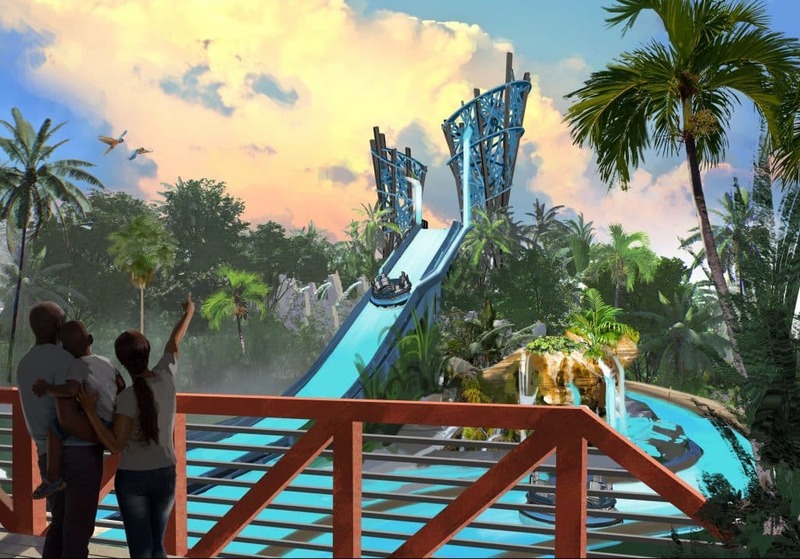 Busch Gardens Tampa’s water park is getting its very first ride since 2015’s Colossal Curl, and it’s a doozy. Vanish Point is actually comprised of three different water slides: two 425-foot-long drop slides (which come replete with a now-requisite beating-heart effect and a clear floor to see the 1,000 gallons a minute of water gushing below you) and a standard 455-foot-long slide (which may be conventional but which is built for speed). 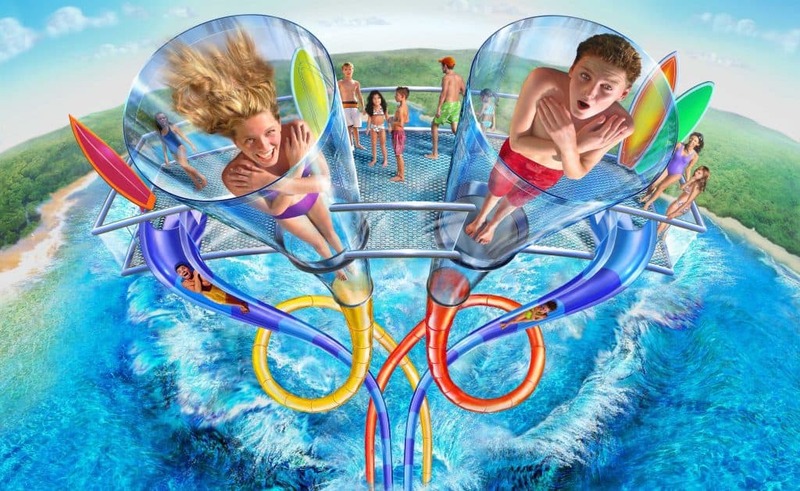 It shares the same general space with the more family-friendly Colossal Curl, with the two queues sitting side by side and the slides intertwining amongst each other. The Great Lego Race takes the physical track layout of the seven-year-old Project X roller coaster and superimposes an all-Lego landscape over it, in which everything the eye can see is made out of the famous bricks. 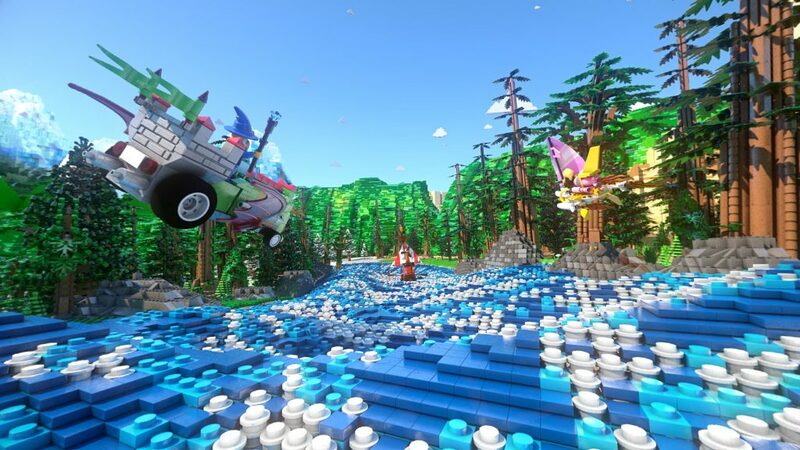 In this brave new world, riders will race against a cadre of Lego competitors – including a wizard, pharaoh, surfer, and pirate – who each pilots a whimsical vehicle, such as a “stylish” scooter fueled by espresso or a rocket-powered windsurfing rig. Rounding out the new experience is a brand-new queue fashioned with interactive elements and an after-race Funnel Cake Factory, a new quick-service venue being set up nearby. Don’t worry – if you don’t want the fancy new virtual overlay, you can still ride the coaster without the VR goggles. You get to become a part of the Fast family when you’re invited to an exclusive, after-race party hosted by none other than Dominic Torreto himself. 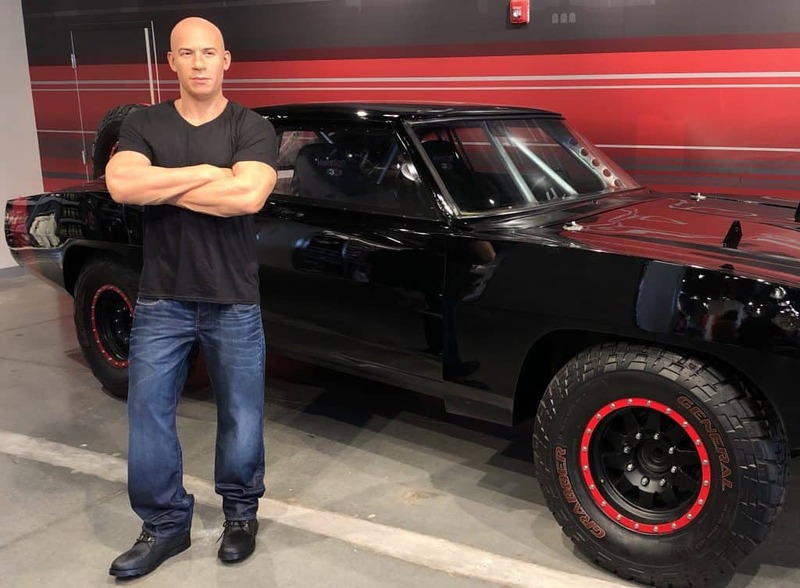 As Tej’s custom-built party bus comes to get you, however, arch-rival Owen Shaw (y’know, the baddie from 2013’s Fast & Furious 6) tracks you down and begins an all-out attack to get his long-sought revenge against Dom and his family. Before the climactic chase through the streets of San Francisco, however, you can make your way through the gang’s base of operations, ogling at Tej’s War Room, taking tons of selfies with the franchise’s various cars, and jammin’ out to Fast & Furious’s soundtrack (all of these nonlinear experiences double as Supercharged’s queue, not unlike how Race through New York Starring Jimmy Fallon does it). 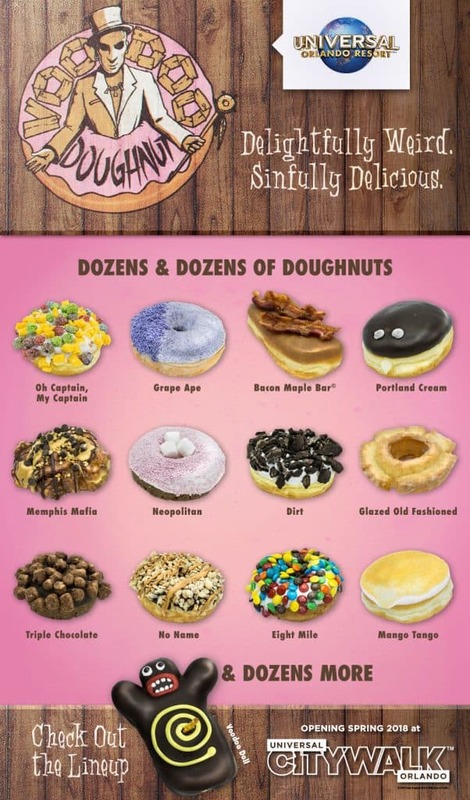 It’s quite honestly hard to say something about Voodoo Doughnut that we haven’t already said in the past six months, but, then again, it’s nearly impossible to not continually heap praise on the idiosyncratic doughnut shop, either. The formerly-exclusively-West Coast chain just about has it all: a massive menu of custom creations (like Oh Captain, My Captain, which combines the toppings of vanilla frosting and Captain Crunch cereal on a raised-yeast doughnut), wonderful décor, an indie recording label, and, yes, wedding ceremonies. Seriously – do yourself a favor and check out the full menu right now. Adventure Island is getting the thrill-focused Vanish Point; Aquatica, SeaWorld’s water park, meanwhile, is receiving a new family-focused raft slide (its first new attraction in three years). Prepare to enter Andy Davis’s backyard, shrinking down to the size of a toy in the process and exploring all the various toys and playsets he’s left strewed around. 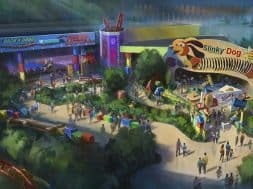 Alien Swirling Saucers is a spinning ride set to an out-of-this-world soundtrack; Slinky Dog Dash is a family-friendly coaster that dominates a good chunk of the themed land; Woody’s Lunch Box is the quick-service restaurant, fashioned out of a thermos and (what else?) a lunch box; and even Toy Story Mania is hopping into the action, getting a whole new section of track and a new entrance unto Toy Story Land. While nothing revolutionary (unlike Animal Kingdom’s Pandora: The World of Avatar or next year’s Star Wars: Galaxy’s Edge), it’s still good, old-fashioned fun – and a desperately-needed shot in the arm for Hollywood Studios. 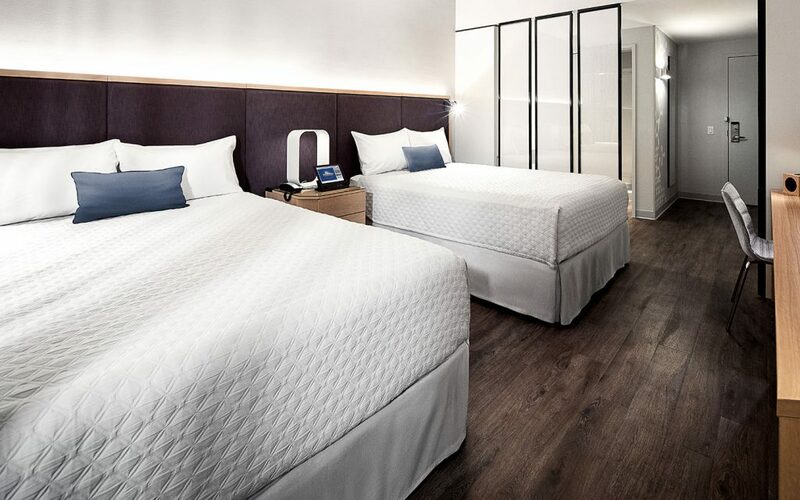 Universal Orlando’s most inexpensive hotel yet offers the least in the way of theming (think sleek and modern, and you’ll know exactly what to expect) but arguably the most in the way of technology. An in-room tablet controls everything from the air-conditioning to room service; the arcade offers virtual-reality experiences; speakers in the pool allow you to enjoy the music even when underwater; and a robot will deliver your late-night pizza to your room. That’s not all Aventura Hotel has going for itself, though: a rooftop bar (that’s 17 stories up) will offer drinks, small plates, and the best view of the resort; the food court will offer sushi alongside the more standard counter-service fare; and the venue will feature a private entranceway to the across-the-street Volcano Bay. 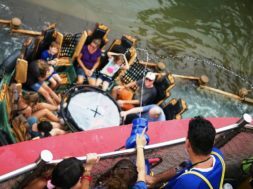 Despite being around for 28 years, Universal Studios Florida hasn’t had a long – or, for that matter, necessarily impressive – track record with lagoon shows. Starting with Dynamite Nights Stunt Spectacular in 1990 (which was primarily based off of Miami Vice) and running all the way up to Universal’s Cinematic Spectacular in 2012 (a celebration of Universal Pictures’s 100th anniversary that lasted for five-and-a-half years), there have only been three – until now. 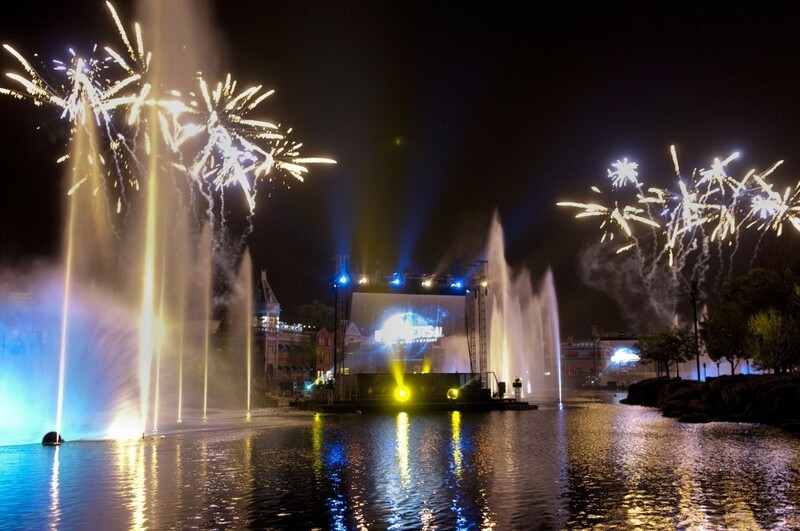 Universal isn’t talking much about what new nighttime experience awaits us this summer, but it has teased that it will, for the very first time, incorporate some of the characters and properties that already exist in the park into the new production. 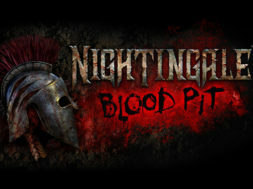 We should also expect to see a new storyline, new music, new animations, and new lighting and special effects. Sounds good to us. SeaWorld is going all-out to combine dark-, water-, and thrill-ride components into one “revolutionary” attraction. Here’s the story: scientists have just discovered the ancient remains of a long-dead South American city along the banks of a freshwater river, and now they’ve invited you to come check it out for yourself. Among the waterfalls, fountains, chutes, category-IV rapids, ruins, and uplifting water conservation message, guests will encounter a unique vertical lift that raises the eight-passenger raft 40 feet into the air before letting it plummet down a hill, creating the world’s biggest drop for a water-rapids ride. Surrounding the attraction will be a mini-land devoted to the newly-discovered Harmony Village, which will offer families several different opportunities to play games and become educated about fresh-water ecosystems. 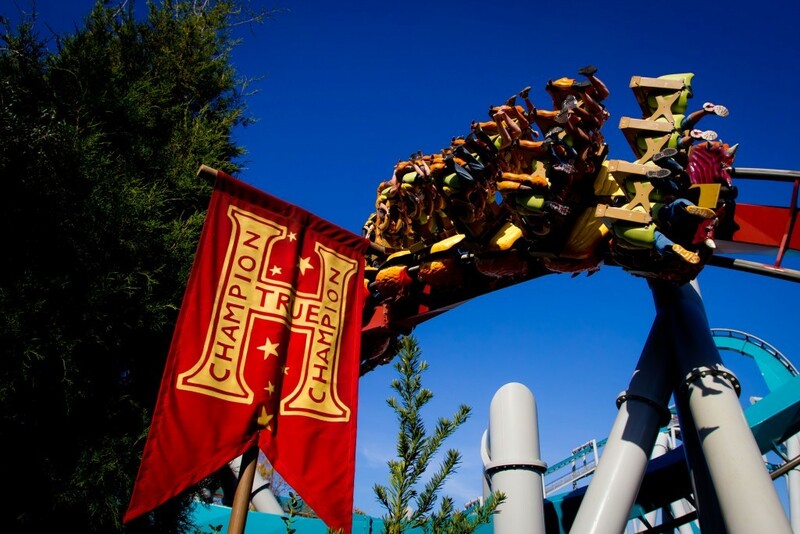 Dragon Challenge was a fun ride, but it had a few things going against it: it was a holdover from the land’s previous incarnation as Merlinwood (part of the original Lost Continent) – limiting the extent to which the Harry Potter theming could be implemented – and it was a massive thrill ride that precluded the younger Wizarding World fans from being able to hop on. The new roller coaster that Universal is building from the ground up changes all this. It will feature characters, creatures, and locations that have yet to be represented in the theme park version of Harry’s wondrous world, and it will be a more inclusive, family-friendly affair. We can’t wait to learn more about the magical new experience, the first (but hopefully not the last) new Potter ride to arrive in five years. Mickey Mouse’s very first ride at a Disney park anywhere is taking over the site of the former Great Movie Ride, making it something of Hollywood Studios’s new flagship attraction. 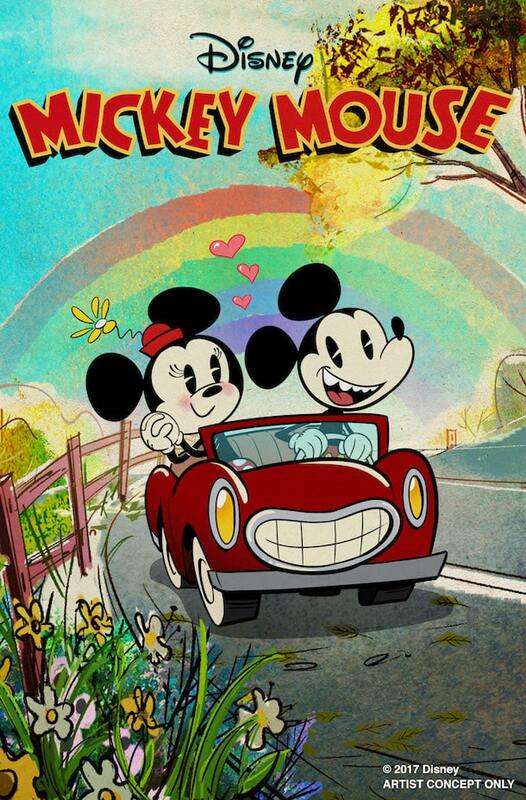 And the company is packing a bit into the new experience in an effort to make it live up to the mantle: a “catchy” theme song is being written exclusively for Mickey and Minnie’s Runaway Railway; the folks over at Disney Television Animation are being recruited to make sure the visuals and narrative are pitch-perfect; and, most excitingly, a glasses-free 3D effect is being implemented – something which Disney bills as 2½D. Landing in the same general timeframe as Star Wars: Galaxy’s Edge might mean its media footprint is impacted, and delivering “only” a traditional dark-ride experience might lessen its hype (especially when compared with Star Wars Land’s various revolutionary elements), but this still is shaping up to be one of the most-fun Disney additions in years. 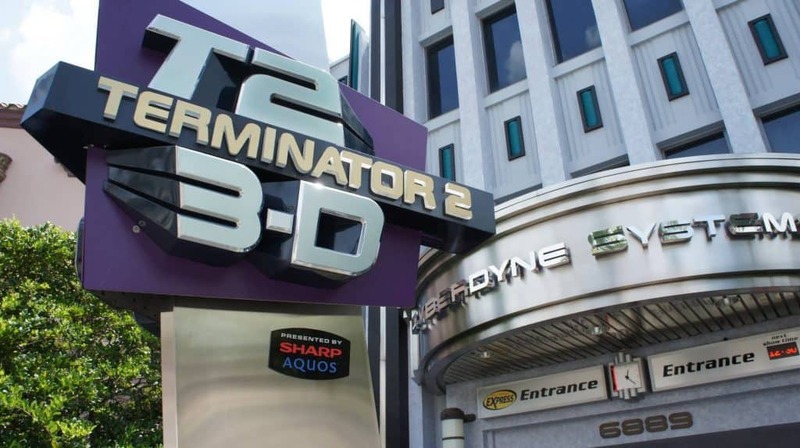 It’s interesting to note that T23D, which was heavily dependent upon real actors alongside audio-animatronics and 3D film footage, is going to be replaced by a predominantly live-actor-driven attraction. (Is this to make up for the loss of Beetlejuice’s Graveyard Revue, which was shuttered to make room for the extra-big Fast & Furious: Supercharged?) Fans should be excited by the news, regardless of what the property will be, as the backlash against 3D motion simulators has been building over the course of the past few years. Pandora: The World of Avatar might have been The Walt Disney Company’s first stab at producing a Wizarding World of Harry Potter-level themed land, replete with fancy new ride vehicles and more immersive surroundings, but Star Wars: Galaxy’s Edge is where the Mouse House is hoping to outshine Universal at every turn. Although the area’s exact attractions have yet to be revealed, everything else that we do know points to an unbelievable attention to detail. Toydarian Toys, a street vendor, will sell “handcrafted” versions of everyone’s favorite characters (including the Porgs! ); audio-animatronic chefs will “prepare” guests’ food; and a reputation system, which is determined by how many galactic credits are in your bank account, will influence the way the residents of the planet Batuu will interact with you. And as for those still-mostly-mysterious rides, we do know this: one will have you and your five teammates piloting the legendary Millennium Falcon, while the other will pit you in some type of battle between the diabolical First Order and the idealistic Resistance. The former site of Wet ‘n Wild Orlando, the original water park in Universal Orlando’s arsenal (and what has been dubbed the very first modern water park, to boot), is so big, it’ll soon be home to not one, but two new hotels. Surfside Inn and Suites will debut in summer 2019, and Dockside Inn and Suites will open in phases throughout 2020; together, they comprise one overarching hotel complex dubbed Universal’s Endless Summer, which will brandish a sun-surf-and-sand theme along with some pretty hefty amenities (two-bedroom family suites, three pools, two food courts, and at least one coffee bar to start with). 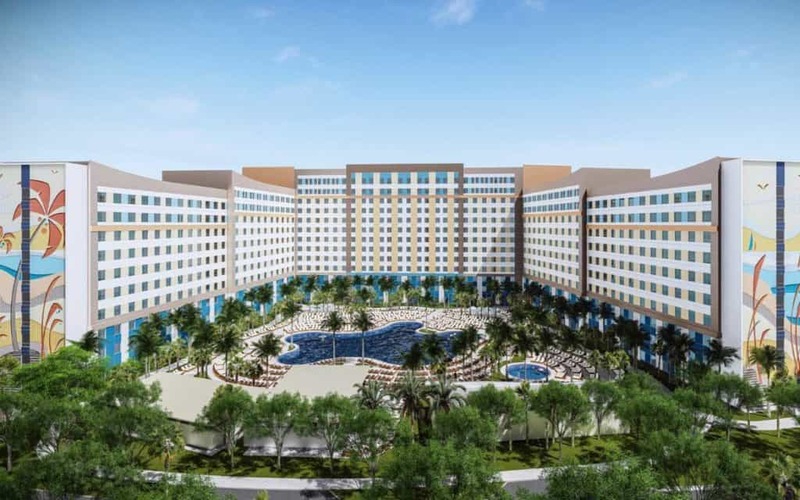 At a combined total of 2,800 rooms (1,450 of which will be the family suites), Endless Summer will easily be Universal’s biggest resort – and it’ll still include all of the other on-site properties’ benefits, such as Early Park Admission, despite the fact that it’ll be located an extra five minutes down the road. 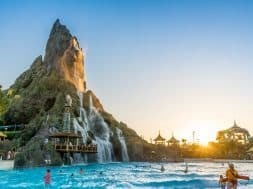 But the biggest feature of them all is the new venue’s price point: at under $100 a night, this will be the most inexpensive option at either Universal Orlando or Walt Disney World Resort. Disney is in the midst of busily preparing to celebrate its 50th anniversary in 2021, and this preparatory work includes making some rather massive additions or updates to nearly all of its four theme parks. 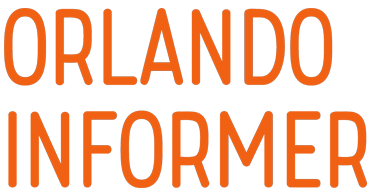 For Epcot, this means completely revamping Future World (including adding in a Guardians of the Galaxy-themed roller coaster) and introducing at least one new ride to World Showcase (that would be Disneyland Paris Resort’s Ratatouille, which is coming to the France Pavilion). But before all that arrives at Disney World’s one-time futuristic park, expect to see something a little smaller but no less cooler: a brand-new space-themed restaurant, which will be installed right next to – where else? – Mission: Space. Details are scant, but the concept art speaks volumes – patrons will be made to feel as if they’ve truly left the planet behind and are dining on a space station in its orbit. Although not as fantastical as, say, Star Wars: Galaxy’s Edge, this new eatery is a love letter right back to Epcot’s very earliest days, when it was meant to be an exploration of mankind’s near future. And, hey – getting yet another delicious destination to visit alongside all of Epcot’s other gastronomical delights can never be a bad thing. Disney is about to offer a brand-new way to travel around a goodly swath of its Florida resort: by sky. 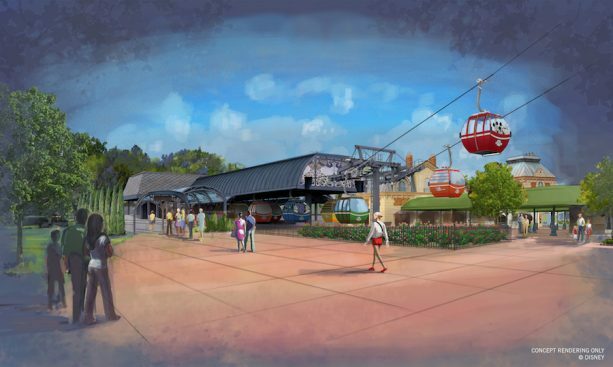 The Disney Skyliner is a giant gondola system that will link Epcot, Hollywood Studios, and the Caribbean Beach, Pop Century, and Art of Animation Resorts. The cabins (well, some of them, at least) will be themed to various classic Disney characters, whether they be from the company’s films or theme-park attractions; the stations where guests board the Skyliner, meanwhile, will all fit their various surroundings – Epcot’s, for instance, will match the European pavilions in World Showcase by being rendered in the early 19th-century style of Art Nouveau, and the Caribbean Beach station (the system’s main hub) will be done up like an open-air Caribbean village marketplace. This should prove to be a fun, easy way to hop from location to location in the Epcot/Hollywood Studios region of Disney World – and, should it prove to be as successful as Disney clearly thinks it will, expect to see it expanded to other sites, such as Animal Kingdom and, just possibly, Disney Springs. 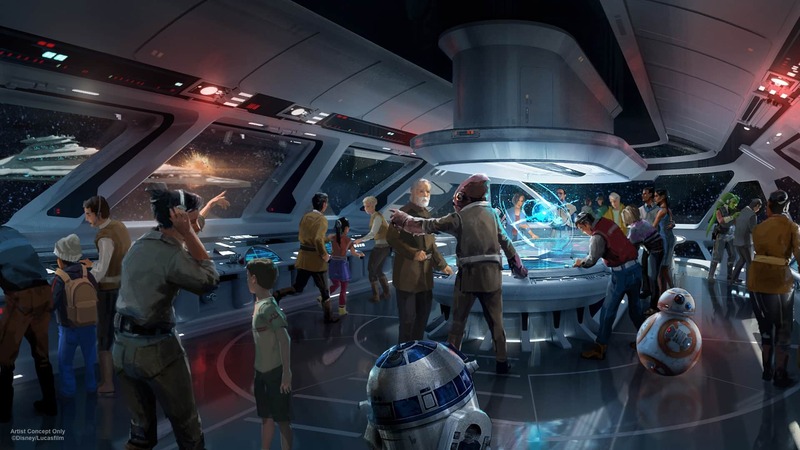 Disney 360 is a brand-new vacation concept that the company will be officially rolling out with its still-unnamed Star Wars Hotel: every second of every day will have you be placed inside of a living, breathing story. 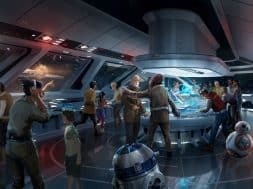 In Star Wars’s case, the adventure will have you board a starliner (that’s the hotel), dress up in costume (if you so choose to), blast off to the distant planet of Batuu (that’s Star Wars: Galaxy’s Edge), and then engage in some private time with the trading-port city (thanks to the resort’s location right on Hollywood Studios property). Each window in the venue will have a view out onto space, with the company even hinting that the occasional iconic starship from Star Wars’s various incarnations can be seen passing by. While it’s still way too early to have any information on pricing, scuttlebutt (that is to say, surveys Disney has been running) suggests that it’ll be priced at $900 per person for the standard two-day package. The newest Disney Vacation Club property – that’s the 15th overall, in case you were keeping track – is heading next to Epcot and will connect with the Disney Skyliner, meaning that value, moderate, and deluxe venues will all be linked together on the same transportation loop. 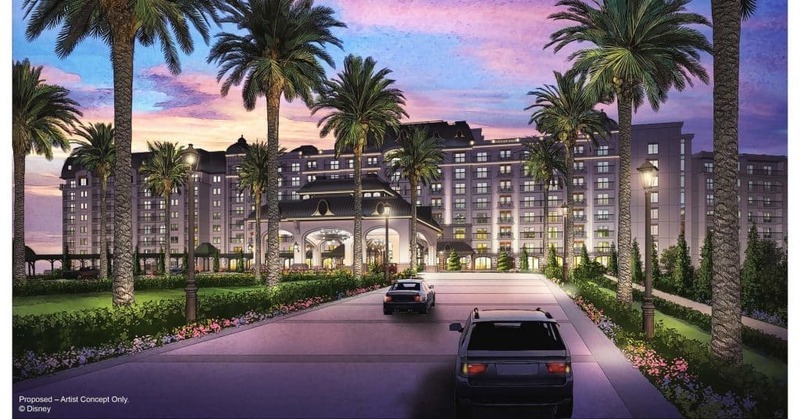 Riviera Resort will consist of 300 rooms (there’s been no exact breakdown of the various room types, but Disney promises that there’ll be a nice variety) and will brandish a rooftop bar, just like Universal’s Aventura Hotel just down the street. 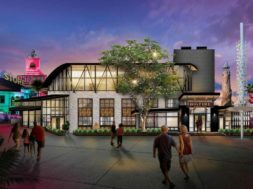 This, actually, looks to be the new property’s biggest selling point: with views of both Epcot’s and Hollywood Studios’s nighttime spectaculars, expect the bar to be one of the most in-demand locations in all of Walt Disney World.